View More In Stockpots - Page 8. Pasta cooker Chef Line is ideal for cooking all kind of pasta and for steaming food, that maintains intact the nutritional values and the taste of food. Suitable for halogen, ceramic, electric, gas, induction. Material: 18/10 stainless steel. 3 layers bottom steel-aluminium-steel. Excellent heat distribution. Measurements: d.22 cm (inch 8 3/4); h.26,5 cm; 6 lt. 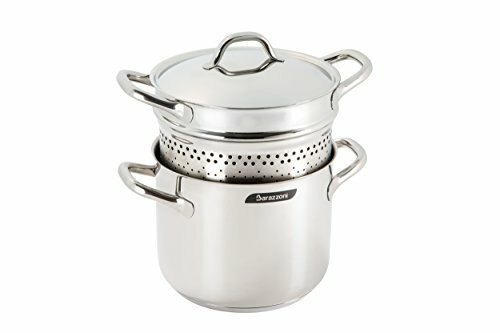 Features: functional basket that facilitates the draining of pasta and steaming all kind of vegetables. Dishwasher safe. Description by Italian Cooking Store. Material: 18/10 stainless steel. 3 layers bottom steel-aluminium-steel. Excellent heat distribution. Features: functional basket that facilitates the draining of pasta and steaming all kind of vegetables. Measurements: d.22 cm (inch 8 3/4); h.26,5 cm; 6 lt. If you have any questions about this product by Barazzoni, contact us by completing and submitting the form below. If you are looking for a specif part number, please include it with your message.